Finding creative ways to cultivate your crops means you can pack more in or grow food in places you wouldn’t have imagined you could. In this short video and article we’ll run through a few of the more unusual places you could be growing your own fruits and vegetables. Let’s start with the fun! Quirky containers are a great way to add additional interest to your patio plantings of fruits and vegetables. Old clothing, boots of blooms, even an old chest of drawers – anything that holds soil is fair game. 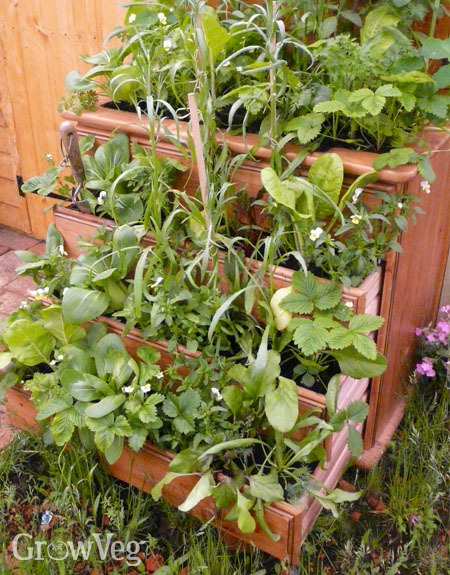 For sheer rustic charm, try sourcing old wooden crates to plant up with all manner of herbs, salad leaves or fruiting vegetables such as tomatoes. Crops in tyres not only look quirky, it’s a great way to recycle too. Turn the tyres inside out to create planters. Or stack them up for growing potatoes, which need gradual ‘earthing up’ as they grow. Larger tractor tyres offer a really wide growing space every bit as useful as a raised bed. Old hessian sacks give a natural look and you can cut hut holes into the sides to poke through plugs of leafy salads and herbs. You could also use them to disguise plastic pots of vegetables fixed onto walls. Fans of growing bags needn’t throw them out at the end of the season. Dig over the potting soil inside, fork in an organic fertiliser, then plant up with leafy overwintering vegetables including chard and winter lettuce. Growing up and off walls and fences is a brilliant way to maximise space in a truly creative way, and if the wall faces the sun it will help to moderate frosts too. Attach pots or containers, or use one of the many vertical-growing systems available to purchase, from columns of edible delights to off-the-wall planting pockets screwed into place. This is also a great way to recycle pallets. Decorate them for visual effect then plant up or set small pots of produce into the boards. Growing in guttering is another way to make the most of wall space, and is well suited to strawberries. Or sow a few rows of pea seeds into a length of guttering for a flush of fresh pea shoots, perfect for cutting young and adding to homegrown salads. Don’t forget slightly more conventional yet no less ingenious ways of growing upwards: trellises with cucumbers, obelisks of climbing beans; or a beautiful arch of sprawling squashes to delineate or frame an area of the garden. Growing edible plants in among ornamental plants isn’t the most obvious idea but the results can be stunning. Many vegetables are good-looking in their own right and rather than detracting from a display will actually enhance it. Think coloured stems and leaves, or vegetables left to flower with dramatic effect. Mixed plantings and 'potagers also help to enhance crop growth, by attracting beneficial insects such as bees while making it harder for pests to hone in on specific plants. While potagers can look every bit as pretty as a purely ornamental border, so too can a well-planned edible front garden. Use a strongly symmetrical pattern as the backbone, then fill it with different leaf textures, colours and crop heights to create a visual feast every bit as good as it tastes. A productive front garden is an intelligent way of making the most of what is often an overlooked space, leaving more of the rear garden for playtime and relaxation. Many of us have no choice but to grow in unlikely spaces – and they don’t get more unusual than up on the roof. From miniature gardens atop sheds, to city roofscapes alive with luxuriant produce, roofs can offer valuable growing opportunities if we’re prepared to think creatively. Balconies, too, can be transformed with a few choice pots of fruits, vegetables and herbs, creating a private place to relax and take in the view. You’ll need to choose containers that can’t be blown over and consider exposure to the wind and sun, but with a little imagination a rooftop or balcony garden can be every bit as productive as one with its roots in the earth below.